The years-long efforts of Local 1000 members and a coalition of champions for retirement security for all Californians are about to come to fruition after SB 1234, the California Secure Choice Retirement Savings Trust Act, was passed by the Senate and now awaits the signature from Gov. Jerry Brown that would make it law. The legislation aims to address the retirement savings crisis faced by more than 7 million Californians who don’t have access to a pension or 401(k) type retirement plan in their workplace. Right now, nearly 1 in 3 California seniors lives in poverty – and half of all seniors have no retirement savings at all. Secure Choice would implement a new retirement investment plan that provides an easy and secure way for private sector workers to save for retirement through automatic paycheck contributions. SB 1234 was sponsored by Local 1000 and Senator Kevin De León. Our President, Yvonne R. Walker, was a member of the Secure Choice Retirement Savings Investment Board, who developed the program that’s about to become law. “We have moved a step closer to a nation-leading breakthrough in alleviating elder poverty,” Walker said. “Stuck between stagnant wages and high housing costs, many Californians have no opportunity for retirement and no choice but to work until they die. 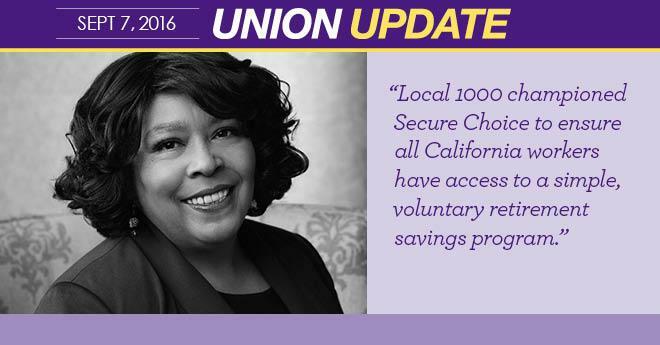 Local 1000 championed Secure Choice to ensure all California workers have access to a simple, voluntary retirement savings program.